Lisa Fronek's words: "As an artist, I love to try new things! 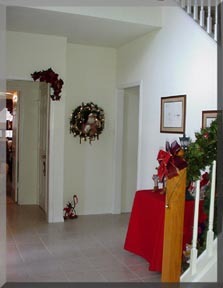 Placing a Santa into a wreath was an idea I had seen in several places and decided to try my own version of it. 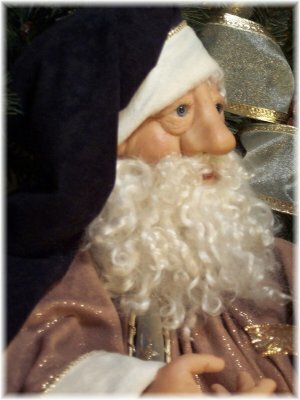 "Harold" would be a 30" tall Santa if he was a full doll. 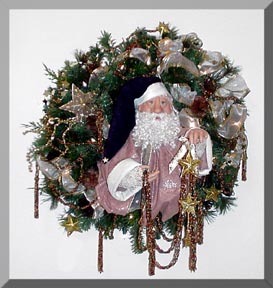 As a bust, he is contained in a 22" wreath of mixed greens and pine cones. He holds a miniature gold ornament on his highly detailed hand. High quality, sparkling blue glass eyes compliment his gold and blue costume. The navy blue moleskin cap is trimmed in beige fur, as are his sleeves. His cloak is also moleskin in a rich camel color that sparkles in gold. Beneath the cloak is a navy blue and gold sparkle material behind an overlay of sheer stars. The wreath is completed with a beautiful sheer ribbon with gold edge and a shooting star ornament. Battery-powered lights, beaded garland and lace sleeves added by Holly.